It appears that autumn has come to the prairies. The garden is winding down, crops are almost ripe, and the evening air has the scent of fall. With everything coming to an end, there tends to be a lot of grass, leaves, and organic garden material left over. What to do with it all? Make mulch! The importance of Organic Mulch can never be over emphasized. Mulch retains moisture and eliminates most weeds, while maintaining a healthy soil structure by encouraging a vigorous worm population. A mulch is a layer of material placed on the soil surface to conserve moisture, hold down weeds, and ultimately improve soil structure and fertility. Mulching protects plants during winter by reducing the dangers of freezing and heaving, and offers several other advantages. For example, a mulched plant is not subjected to the extremes of temperatures that affect an exposed plant. The roots of unmulched plants can be damaged by the heaving of soil brought on by sudden thaws and freezes, but a mulch acts as an insulating blanket, keeping the soil warmer in winter and cooler in summer. Mulch that has been applied to the soil during the spring and summer can be turned under in fall, thereby enriching the garden soil. Moreover, certain materials used for mulch contain rich minerals. These break down gradually and work into the soil to feed the roots of plants, soaking into the ground during the first heavy rain. Therefore, mulch fertilizes the soild while it remains on the soil surface, as well as after it decays. For the busy gardener, mulching is a boon indeed. Many backbreaking hours of weeding and hoeing are practically eliminated and machine cultivation is not necessary. 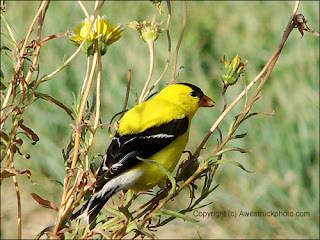 Weeds do not have the change to get a foothold, and the few that do can be hoed out quickly. Since the mulch helps keep the soil loose, there is no need to cultivate. The mulch also keeps the wind and the hot, drying sun from evaporating soil moisture. A few good soakings during the long growing season wil tide the plants over a long dry spell, and mulched plants often endure a long dry season with little watering. Soil underneath the mulch remains cool and damp to the touch. At harvest-time, vegetables that sprawl on the ground - cucumbers, squash, strawberries, unstaked tomatoes - often become mildewed, moldy, or develop rot. A mulch prevents this damage by keeping the vegetables clean and dry. In addition, mulched rows are easier to walk on and low-growing flowers and vegetables are not splashed with mud. Practically any organic material can be used for mulching. However, since different materials have different textures and properties, they differ in suitability. Coarse and ragged in appearance, alfalfa is most easily handled when green and freshly cut. It has a high nitrogen content and will supply the nitrogen requirements of fruit trees. Buckwheat hulls make a clean and attractive mulch, but they are expensive and hard to obtain. They can be spread one or two inches deep in summer, and deeper in winter. Excellent as a mulch, they absorb 2 1/2 times their weight in water. Ground into one inch pieces, corncobs have many uses. Their sugar content will help increase the microorganisms in the soil, and the material itself will give a better soil granulation. When using cobs as a mulch, use a layer at least 6 inches deep, and apply a nitogenous material - blood meal, cottonseed meal, bone meal, or compost - to the soil first. Shredded cornstalks also make excellent mulch. Shredded leaves make an excellent mulch as they do not mat down, and they enrich the soil more quickly than whole leaves. There is rarely any nitrogen deficiency in leaves, so it is not necessary to apply nitrogen to the soil before mulching. 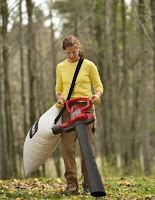 If unshredded, leaves should be mixed with straw or some other light material so that they do not become a soggy mass. The mixed mulch can be applied 8 - 12 inches deep for winter. DO use Pine bark, Compost, Mushroom compost, Stable straw, Leaves, Grass clippings, Wood chips, Wood shavings, Sawdust, and Seaweed for mulch material. DON'T use grass clippings and stable straw too thickly, as they will generate heat. DO hose down seaweed to wash excess salt away before placing on the garden. DON'T use pine needles or gum tree leaves too thickly, as the material will form a mat which will not allow moisture to pass through. DO place mulch on the garden, but not too deep that water and air cannot penetrate. - Blows, vacuums, shreds with precise force! Don't just blow leaves around! Using a leaf blower is fine for clearing a small area, but it's no way to clean a whole yard. The Leafmaster is a powerful electric tool which vacuums up leaves, shreds them into mulch, and collects them for composting or disposal. Leaves are one of nature's best soil conditioners, but a few trees' worth of fallen leaves can really add up. 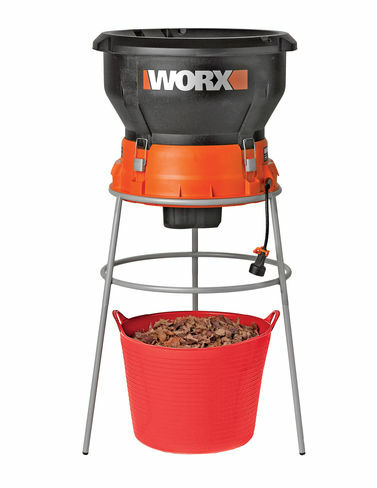 This easy-to-operate electric shredder converts 11 bags of leaves into one bag of mulch. Coco Tree Mats Suppress Weeds Better than Bark Mulch. Lightweight and easy to work with; slips easily around a tree trunk. These rings last three years or more! 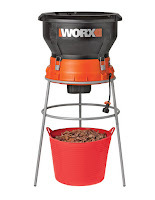 - Choice of four sizes: 24", 36", 48", and 60"
If you're not diligent about replenishing bark mulch, it can start to look messy and start letting weeds through after just one season. These thick mulch mats are made of tightly woven coconut fibers and durable natural latex, so they stop weeds for several seasons. They reduce string-trimming chores too, because you can mow right over them. - Tough, long-lasting cart holds up to 500 pounds — as much as 10 wheelbarrows! Designed specifically to meet the needs of gardeners, not adapted from an industrial utility cart. The garden wagon has big wheels with pneumatic tires roll easily over rough terrain. High sides prevent loose loads like mulch and compost from bouncing out. The axle is positioned to distribute the weight and balance the load. The long handle lets you push or pull with equal ease and has a comfortable neoprene grip. Tough, rust-proof aluminum frame; end slides open for easy dumping. Rated "Excellent" by a leading consumer magazine. This remarkable red mulch helps tomato plants grow faster and produce more abundant crops. 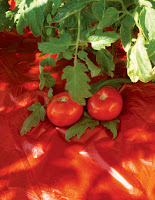 Specially engineered red mulch reflects far-red light wavelengths upward into your tomato plants. This triggers the release of a natural plant protein that stimulates more rapid growth and development. Your plants will mature faster, look bushier, and give you a more flavorful, more abundant harvest than ever before. Also may be used with strawberries, melons, red peppers and other crops that fruit above ground. Micro-perforations allow water, air and nutrients to reach the soil surface. Not designed for weed suppression.